For me, a Bank Holiday always comes with a feeling of being able to achieve so much - that extra day opens up so many possibilities. My plan for this weekend was to have a clear out - edit my overflowing accessories collection of shoes, handbags, belts and jewellery. The plan was to end up with a capsule collection, which gave me enough choice for all occasions. The criteria was that anything not used within the past year, or was in poor condition was destined for the charity shop. 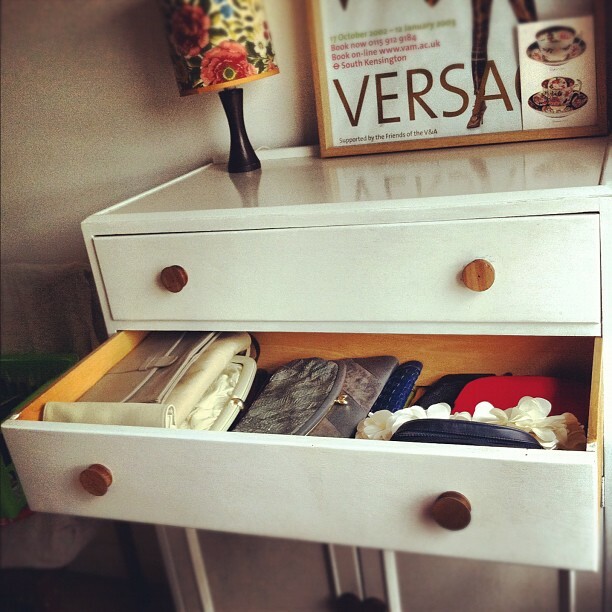 Hopefully a tidy wardrobe will equal a tidy mind. It seems that the folk over at The Guardian had the same idea - when I opened the newspaper on Saturday, I was hit with their Sort Your Life Out magazine issue, full of ideas and tips on how to de-clutter and re-organise your belongings. Handbag storage has always had its difficulties - first of all, I have too many, and second of all, they comes in so many varied, awkward shapes and sizes. 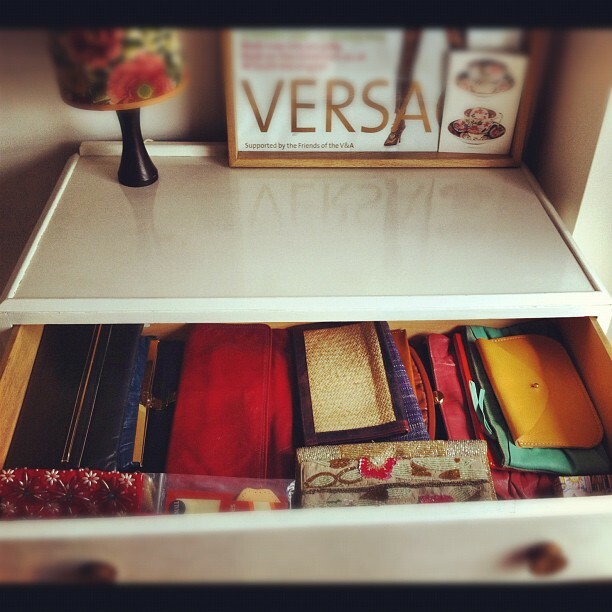 I've always maintained that drawers are the best storage solution for pretty much everything - toiletries, make-up, jewellery - drawers keep things dust-free and always easily accessible. 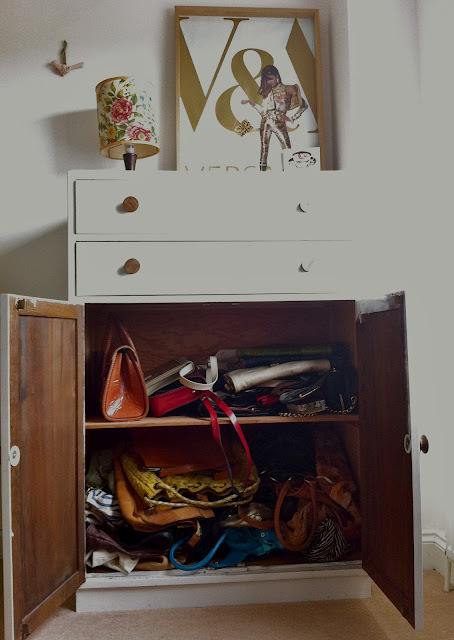 For small handbags, purses and clutch bags, drawers are just the thing, but as your handbags get larger, a cupboard with shelves is the way to go. And I've found the perfect piece of furniture to meet all these requirements: this tallboy I bought from Odds & Todds in Bristol five years ago, for a mere £12. 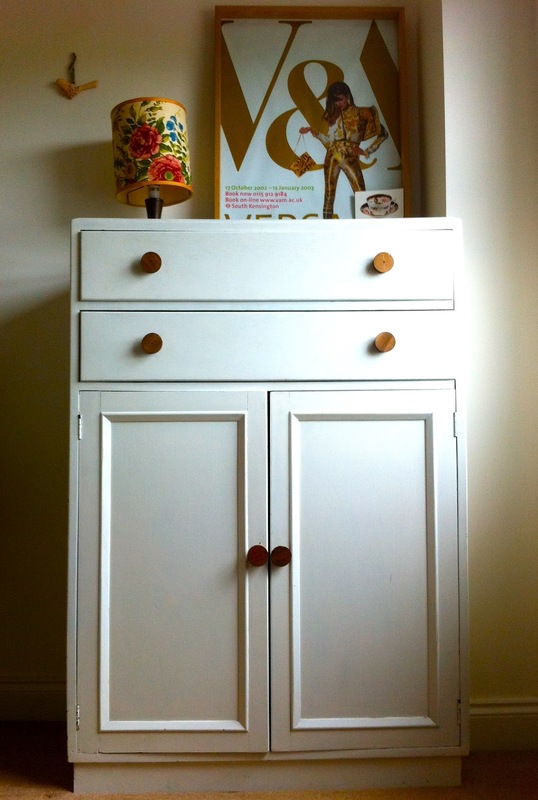 I can spend many a happy afternoon browsing a junk shop or house clearance shop, and see loads of these type of cupboards around. 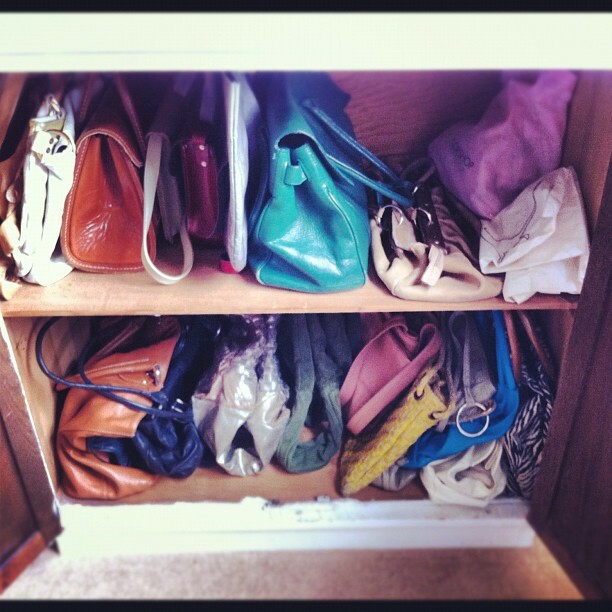 I think they're seen as a bit old-fashioned now, but for handbag storage, I've never found anything better. But in the last few months, my hoarding tendencies have taken over, and the bags have multiplied, and I haven't been able to see the woods for the trees. 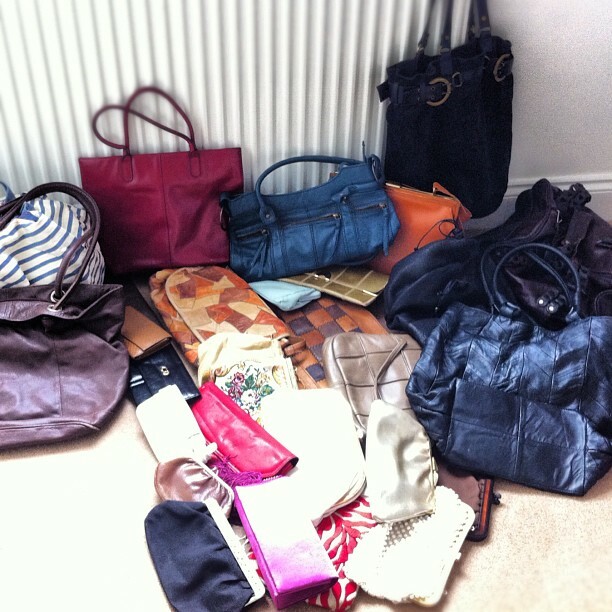 It was time for a handbag cull, and I was feeling ruthless and ready for some pruning. A joyful hour of sifting and sorting produced some good results - with the handbags which didn't make the grade destined for the charity shop at Hannah's at Seale Hayne - my favourite hunting ground on my trips to Devon. I then cleared out any left-over debris from the contents of each bag, which amounted to £1.06, three pens, a lip-gloss, two lip-balms, taxi cards, a battery, some Savlon and enough kirby grips to construct a life-size model of the Eiffel Tower. Then I treated each bag with this protecting cream - the more you treat leather, the longer it will last. Right - next it's on to my shoes.